Please select an option Black Silver White Please select a color. A great day begins with a smile, and the piece Polar Bear Arctic - Framed by artist Adam Schwoeppe will ensure that every morning begins with a gleam in your eye and a pop in your step. It is a large wall art piece featuring animal silhouette subject matter, with all of the energy and detail of the original masterpiece. This artistic giclee print on metal features a creative new twist: the main art panel is mounted to a larger back panel creating a border around the edges, framing in the finely-raised artwork as it floats slightly off the wall. The artwork on the main panel uses UV-cured acrylic inks in a cool tones, colorful color palette, applied directly to the surface of the metal. 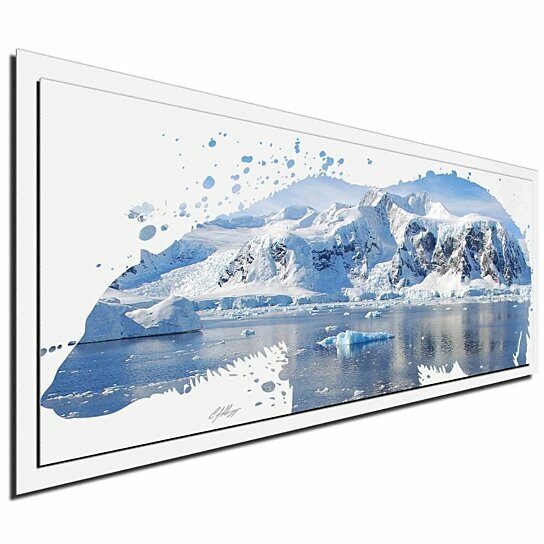 This art panel is then mounted to a semi-gloss metallic back panel (available in several minimalist color and size options) for an attractively trimmed, textured and layered display that is durable, resilient, and easy to clean. Artist: Adam Schwoeppe Title: Polar Bear Arctic - Framed Medium: Colored Metal Style: Contemporary Animal Silhouette Art / Metal Polar Bear Picture / Nature Photography Decor / Cool Tones Painting Print / Abstract Fine Art Giclee Priceless Peace of Mind: Made in the USA, in our Cincinnati art studio. Includes Certificate of Authenticity, Color & Quality Guarantee, and Limited Lifetime Warranty. Simple Hanging: Lightweight yet durable metal that hangs on drywall, wood, masonry, etc. using household nails, screws, hooks or french cleats with sawtooth brackets and padded spacers on back. Artwork will float about 1/2in off wall. Versatile & Low-Maintenance: Suitable for indoor/outdoor use (weather and fade resistant.) Artistic metallic matte finish on colored metal. Easy cleaning: wipe with soft/clean cotton cloth; use warm water & mild hand/dish soap if needed. Note from the Makers: We are all about quality work & happy customers. We are eager to work with you on any questions, concerns or customizations. We ship worldwide.